Meet your classmate Jhossua Childs Quevedo, a digital marketing consultant and a Digital Marketing Specialization Graduate. I was born in the city of Quito, located in Ecuador. My father is from England and my mother is from Ecuador, which is why my name is peculiar to the country in which I live. My name causes a lot of confusion in people, they either write it wrong or say it wrong, but I’m already used to it. I hope to extend my services to social media channels in the future. I love learning new things and developing new skills. I decided to study this specialization because the world is becoming more competitive and you should always try to differentiate yourself. This specialization gives you some tools to stand out and get more job opportunities. How have you applied what you’ve learned throughout the Digital Marketing specialization? I apply the knowledge I gained in this specialization by making myself known as a digital marketing consultant. In this way, I acquire more experience in this field and help small businesses expand and grow. Just do it! It’s a challenge that demands time and effort, but everything will be rewarded in the end. At first, concepts can be confusing when you don’t have much experience in the field, but as you advance in the specialization and the knowledge solidifies you realize that the world of digital marketing can be very exciting! 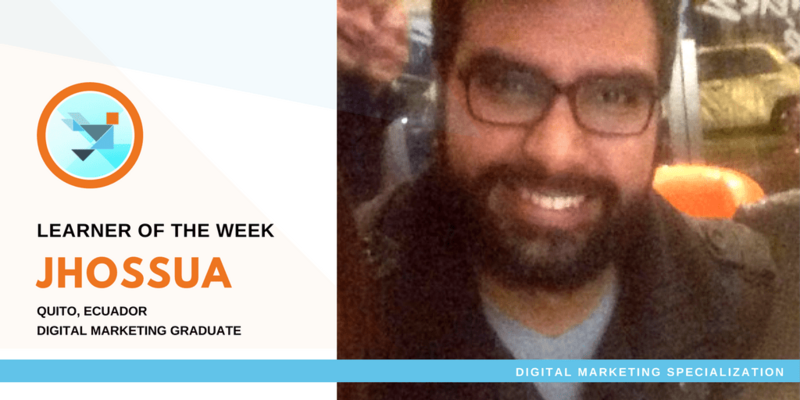 Email us at cobcourserastaff@gmail.com to be featured as the next Learner of the Week!